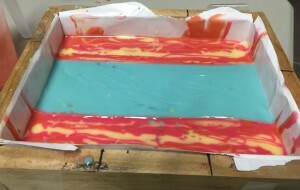 When I heard the name of this month’s soap challenge I couldn’t imagine what the design would be. 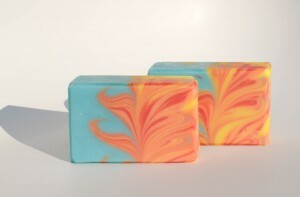 Turns out it is a combination of two designs – the mantra swirl and Ebru marbling techniques and the soap had to be made in a slab mold. 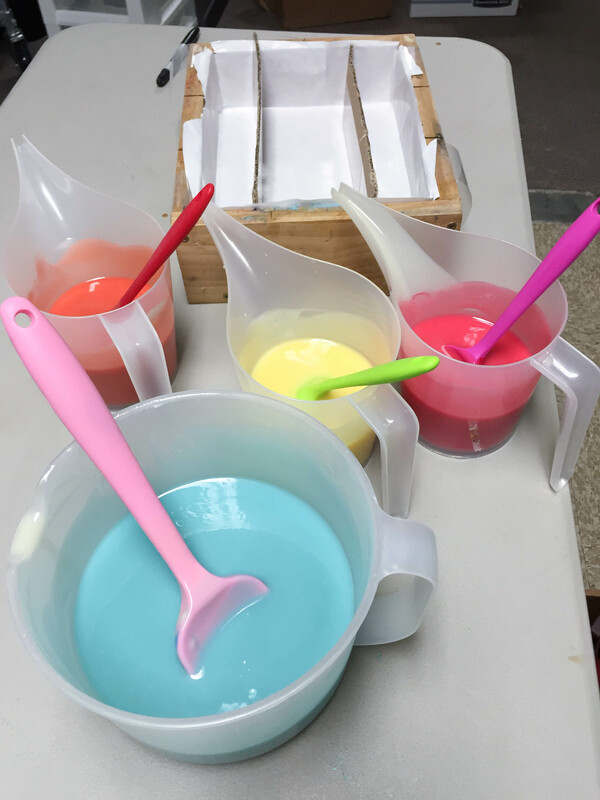 It will be much easier to show some pictures than try to explain the process. 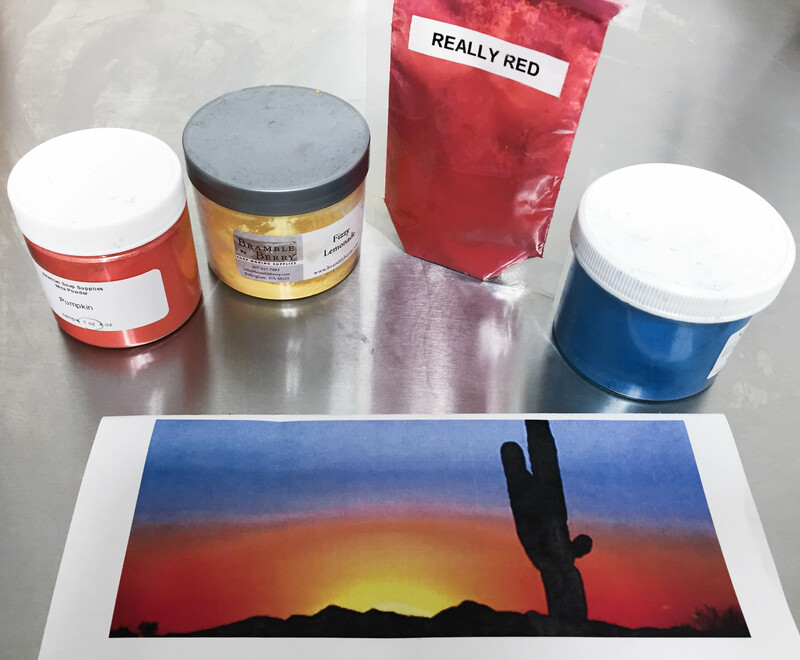 The fragrance I decided to use for this challenge was Arizona Sunrise. It is well behaved in soap and smells very fresh and uplifting (mainly citrus). 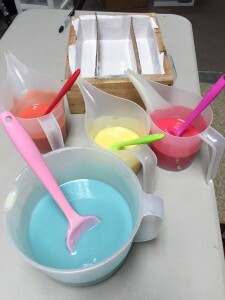 A quick Google search yielded this picture for color inspiration. I reached for my smallest slab mold since I wasn’t at all sure about this design. This mold will yield 8 to 9 bars depending on how it is cut. The dividers were required for the design so I made them out of cardboard that I covered with packaging tape. So the blue is the sky with the red yellow and orange the reflection of the rising sun. 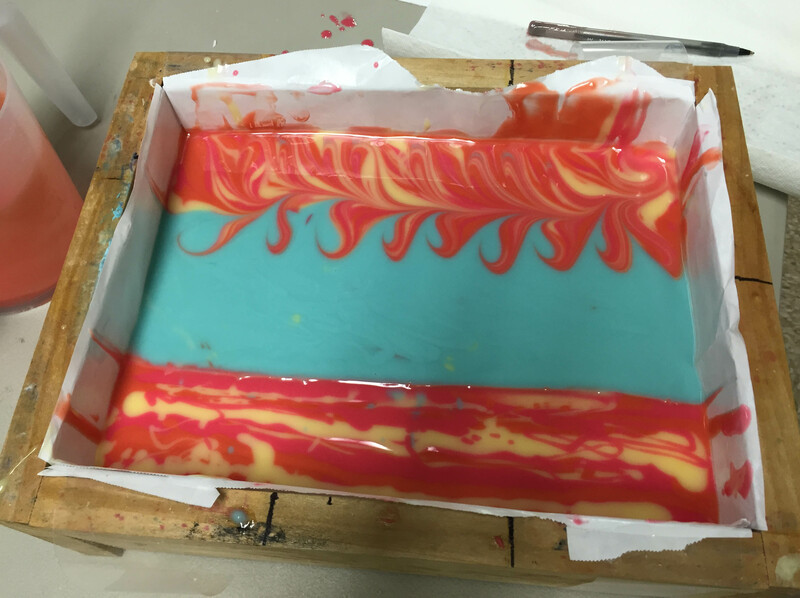 I poured the sun colors in horizontal lines in an attempt to get streaks of color across the sky for the Marble part. Now to remove the dividers and on to the Mantra swirl. Yes I made a huge mess. I think the cardboard dividers intimidated me. 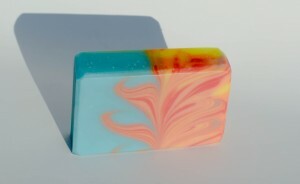 There are some drops in the blue but I have learned that they will not make a difference after the soap is swirled. 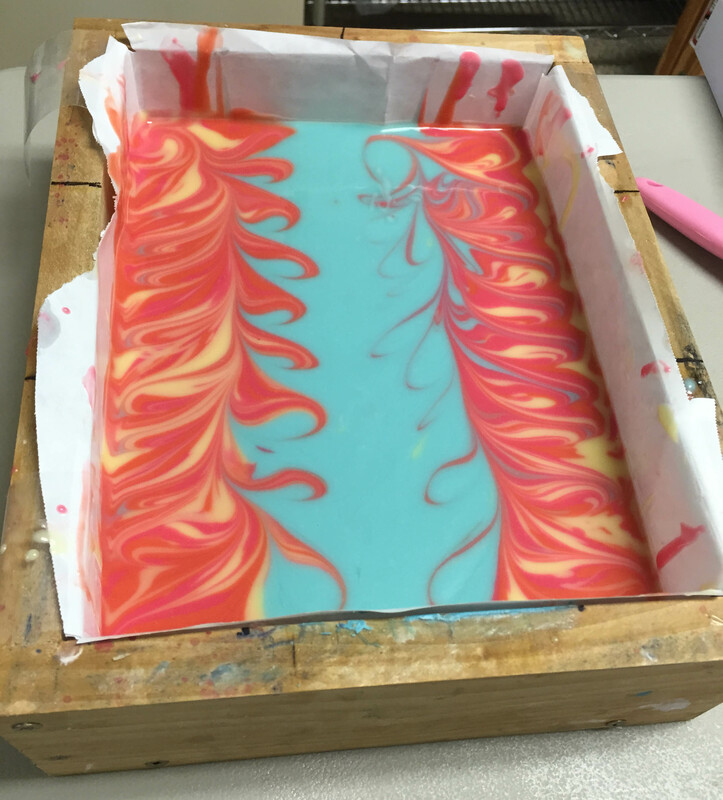 When I first started soaping I would have been horrified that I colored outside the lines. The first side is finished with the Mantra swirl which is simply making figure “8”s down the length. I used the same instrument to make the figure “8”s on the second side but had an entirely different result. My guess is that I must have held it at a different angle. 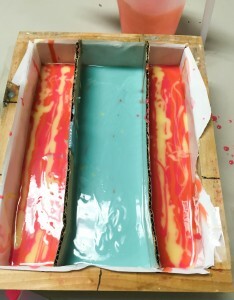 It is in the back of my mind to experiment with this later to see if I can determine the difference. At that point I was not very happy with my soap. 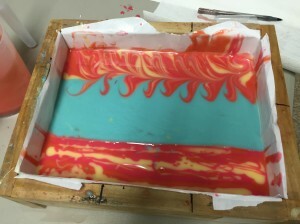 But after cutting it I think it is a very interesting design and I am happy that the orange and red are distinguishable (wasn’t sure they would be as I was pouring the stripes). Thanks Amy! Another one that made me go outside my comfort zone. Great colors & beautiful soap! It’s so great to see everyone’s personality come out in the challenges!! I like to stay inside the lines too, but I’m learning it’s ok to wander outside the lines sometimes. 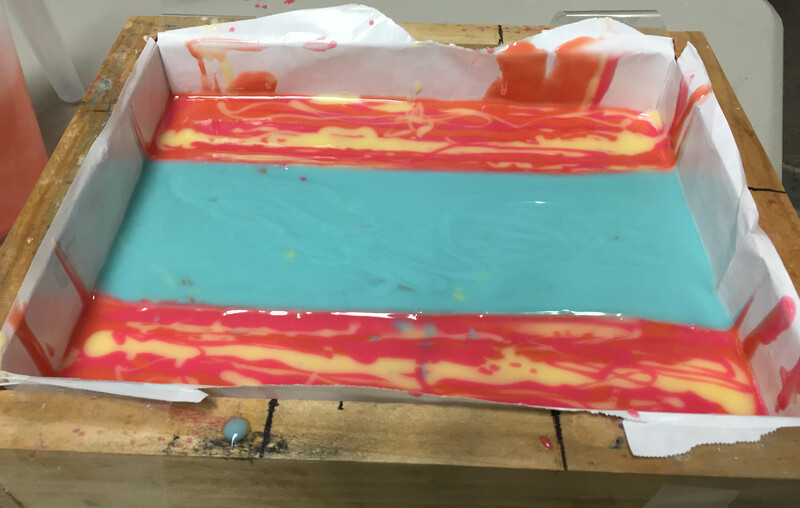 Your soap turned out magnificent – love the bold, bright color palette! Fits the theme perfectly. Thanks Amy. You are always so encouraging. I live in AZ, I think you’ve done a superb job and want to reach through my screen and grab a bar! Beautiful! Your coulours are gorgeous! 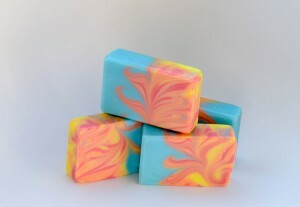 This is a beautiful soap! I love it!